Fuzokuzu, better known as Hikone Byobu since it was transmitted in the Ii family of Hikone, is rich with its composition that provides a narrative sense and the minute descriptions found in the figures and furnitures depicted. However, not much is known about the artist or the background for its creation. In addition, several interpretations have been made as to the fact that, the six pieces that constitute the folding screen have been passed down separately even though it is called a byobu (folding screen). As this screen will be restored over a period of 2 years from fiscal year 2006 as a project subsidized by the Agency for Cultural Affairs and Shiga prefecture, an investigation of the screen was conducted by the Hikone Castle Museum and the Institute. High-resolution digital images, infrared and photo-luminescence images were taken, and X-ray fluorescence analysis was made. Presently, we are editing the report on the results of our investigation that is scheduled to be published on the occasion of the opening of the exhibition “The National Treasure The Hikone Screen and the Refined Beauty of Koto Ware,” which will be held at the Hikone Castle Museum from September 28 to October 26. High-resolution images will be exhibited and a symposium will be held during this exhibition. In addition, the processes of restoration and points that have been elucidated through our investigation will be made public along with the restored screen. A photograph taken during a field trip to China by Yashiro Yukio and his team in 1940. 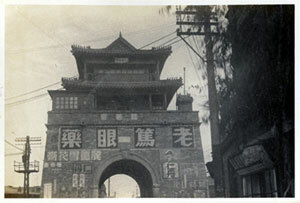 It is clear that at that time there was an advertisement for Jintan on a gate in Beijing. 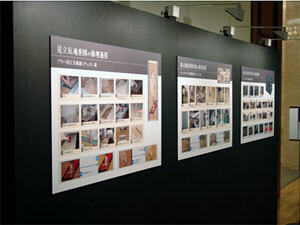 The National Research Institute for Cultural Properties, Tokyo is engaged in the cooperation of the conservation of Japanese art objects that are in the collection of art galleries and museums overseas and in conducting joint research concerning conservation of such objects with their respective institutions. On April 20, 5 paintings and 1 craftwork whose restoration was complete at the end of March 2006 were introduced to the Administrative Committee of the Cooperative Program for the Conservation of Japanese Art Objects Overseas. In addition, a special exhibition was held from May 15 to 27 at the Thematic Exhibition Room on the first floor of Heiseikan of the Tokyo National Museum so that this project may be more widely known. 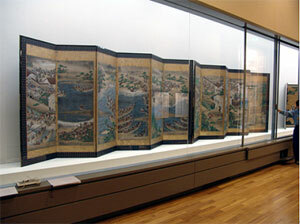 These objects are: Struggles of Genji and Heike Clans (a pair of folding screens; Osterreichisches Museum für Angewandte Kunst, Austria), Screens Illustrating Views of Kyoto and its Environs (a pair of folding screens; Royal Ontario Museum, Canada), Scenes from the Hogen Monogatari Tales (a folding screen; Naprstk Museum, Czech Republic), Meikocho (a folding screen; National Gallery in Prague, Czech Republic), Female Ghost (by Utagawa Toyoharu, a hanging scroll; ibid) and Makie Decoration Cabinet with Landscape and Human (Museo National de Artes Decorativas, Spain). Data on traditional Japanese musical instruments can now be retrieved from the “Database on Traditional Japanese Instruments Designated as Cultural Properties” (ed. Department of Performing Arts, March 2006, in Japanese), which was introduced in TOBUNKENNEWS Vol. 25. From 2001 questionnaires on traditional Japanese musical instruments were sent to museums throughout Japan and boards of education of the prefectures, cities, towns and villages. This database is based on replies to those questionnaires from the boards of education and information obtained from the web sites of prefectures and cities. 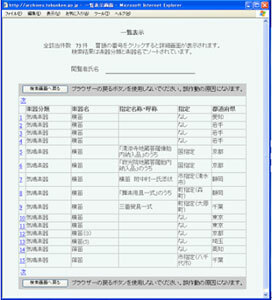 It is composed of 4 items: type of instrument, name of instrument, designation, name of prefecture. Categorization of the type of instruments is based on the Sachs-Hornbostel system and classified into chordophones, aerophones, idiophones, membranophones and excavated instruments. With regard to the names of instruments, it is possible to retrieve information by part agreement search, for example by inputting tsuzumi instead of kotsuzumi or fue instead of ryuteki (fue used in gagaku). There are 6 kinds of designation: by nation, prefecture, city, ward, town and village. However, recent changes due to the merger of cities, towns and villages are not reflected on the database. Data will be updated from time to time so that it will be possible to confirm the location of traditional instruments. Cruydt-Boeck is a herbal written by Rembertus Dodonaeus (1517-1585), a Belgian naturalist. An original copy of its second edition in Dutch (1618) was imported to Japan during the Edo period. It is known that Noro Genjo and others wrote the first herbal in Japanese from 1741 to 1750 by order of Tokugawa Yoshimune based on a translation of Cruydt-Boeck. It is also said that Ishii Toko, Yoshida Masayasu and others made a complete translation by order of Matsudaira Sadanobu in 1823. Of the several copies of the original said to have been imported, the one in the collection of the Waseda University Library was separated into 7 volumes after being imported and then re-bound as a book. The first of the 7 volumes is being restored by Okamoto Koji, a book restorer. In the process of restoration, it was found that a very sophisticated Western style of bookbinding was used for the original copy and that there is a possibility that it is one of the oldest books made in this style in Japan. 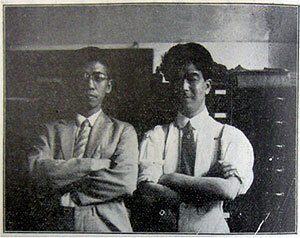 Thus, on request from Mr. Okamoto, the National Research Institute for Cultural Properties, Tokyo set off to conduct a scientific analysis of the binding materials in cooperation with other institutes in order to obtain information that will enable us to determine the period at which it was made bound. To this day, image scanning analysis by Kato Masato of the Center for Conservation Science and Restoration Techniques has revealed that paper used for a book published in France in the latter half of the 18th century was used for the inside cover. In addition, attenuated total reflection analysis by Sasaki Yoshiko of the Kyoto Institute of Technology points to a great possibility that domestic hemp was used as binding thread. Furthermore, UV-visible reflection spectroscopy by Yoshida has shown that the cloth binding, which is thought to be Jouy print, was dyed with indigo. Since the original copy is severely damaged, extreme care is taken to research the various materials. For this reason, it will require much more time before we can obtain the above-mentioned results. We hope to continue work so as to clarify the history of this original copy little by little by selecting analytical methods most appropriate for each material. The fifth phase of the Joint Research on the Conservation of the Mural Paintings of the Dunhuang Mogao Grottoes is in its second year. Staff of the National Research Institute for Cultural Properties, Tokyo was sent to Dunhuang Mogao Grottoes for three weeks from May 8 to conduct the first half of this year’s joint investigation. Investigation that was begun last year was continued at Cave 285, which is considered very important because of the inscriptions of the years 538 and 539 found there and of its traditional Chinese subjects in addition to its Buddhist art. 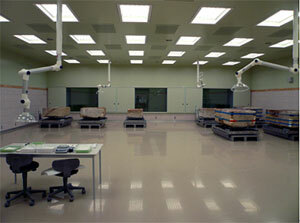 Photographs were taken and analysis using digital microscopes and visible spectroscopy were conducted. Moreover, additional sampling was done not only from the walls of Cave 285 but also from those of Caves 268, 272 and 275, which are considered the earliest extant examples, to determine the period of the caves by radio-carbon dating in a joint study with Nagoya University. Various preparations were also made for the latter half of the joint investigation, which is scheduled for this summer, and for the joint research that will be conducted with the staff of the Dunhuang Academy who will be visiting Japan after autumn. 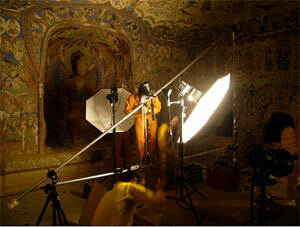 Furthermore, three graduate students went to the Mogao Grottoes from Japan with this investigation team. They were selected from different fields of discipline – namely conservation science, restoration of paintings and management of cultural heritage – as “trainees dispatched to Dunhuang” by public announcement. They will stay in Dunhuang until mid-September and receive guidance from specialists at The Conservation Institute of Dunhuang Academy concerning diverse matters related to the protection of mural paintings. This training is expected to continue for three more years and will open the way for young Japanese specialists, who have little chance to directly study the conservation of mural paintings. 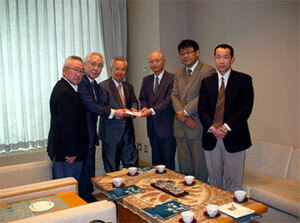 We expect them to contribute to conservation in the future both in Japan and overseas.